Model #M88WRD824. 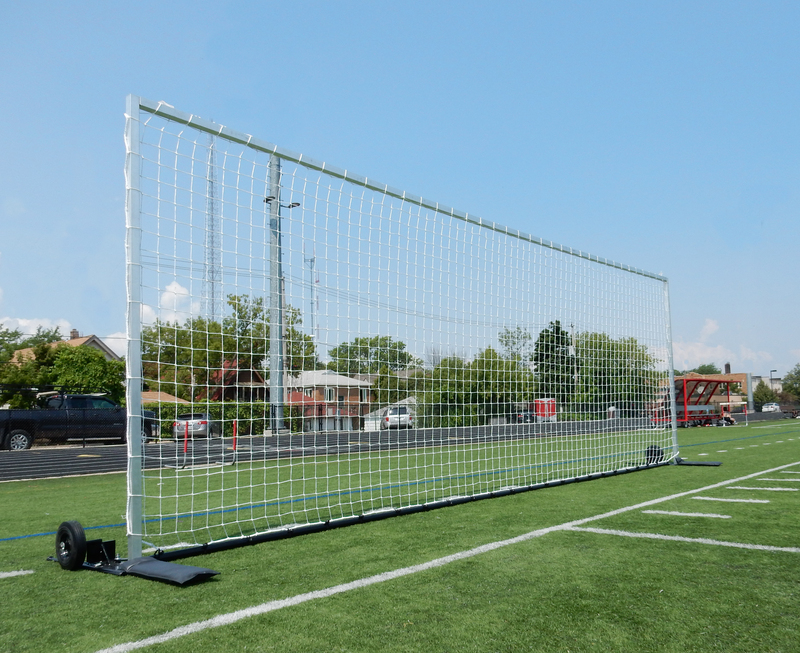 8×24 Ultimate Wheeled Soccer Goal. Model #M88W. Side Back Wheel Locked. Model #M88WRD4. Front Side Wheel. Model #M88WRD824. 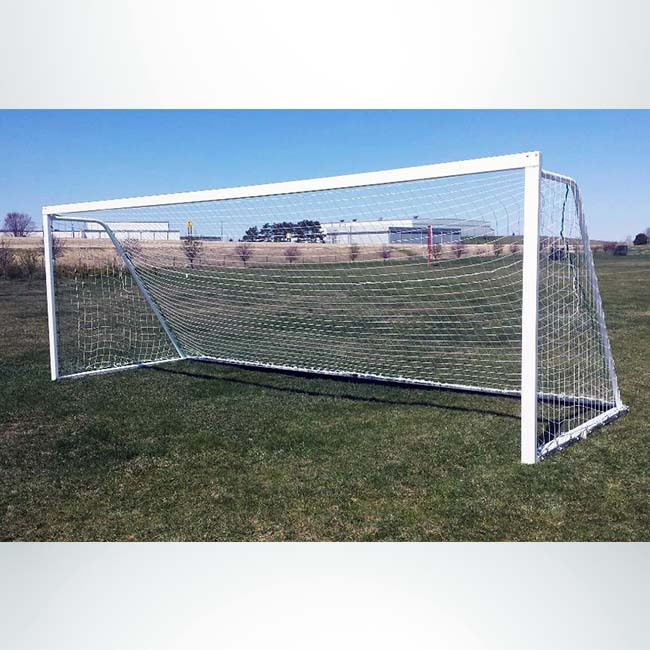 8×24 Ultimate Wheeled Soccer Goal. Green Football Post Pad. 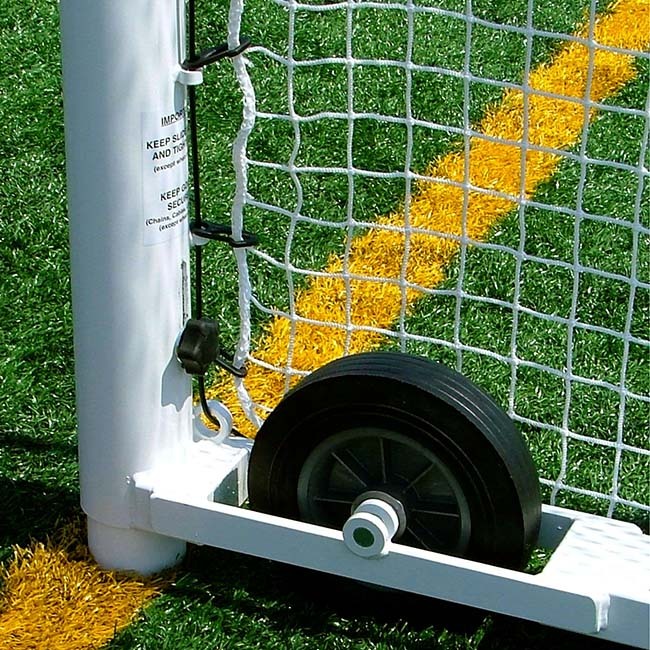 Ideal portable soccer goals with wheels built into the frame. The Ultimate Wheeled Soccer Goals are an industry classic. 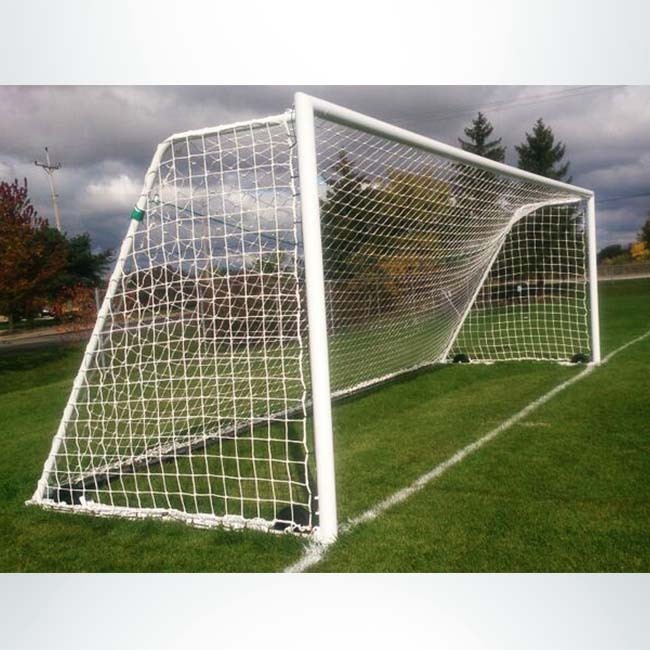 Since 1988 these goals have been as durable and reliable as any on the market. 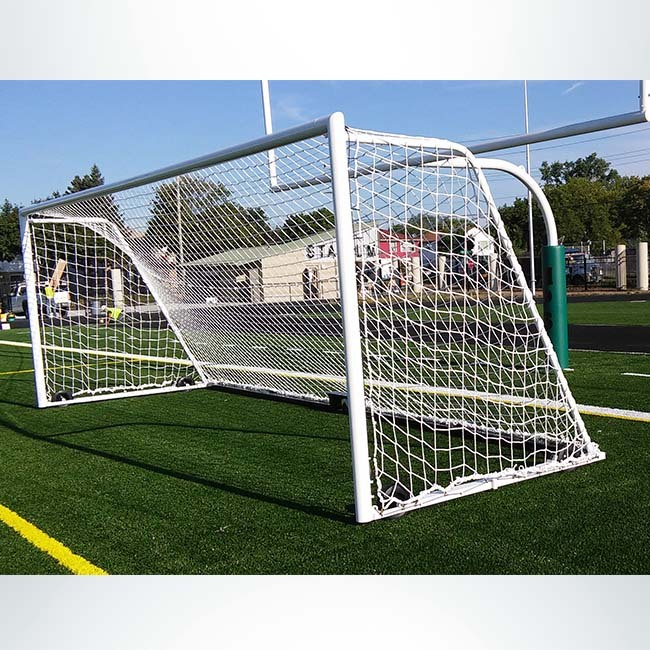 Ultimate Wheeled Soccer Goals are made with 4″ round steel verticals and an aluminum crossbar. 5 semi-pneumatic wheels are built into the frame of each goal. • Solid and safe with a self-supporting design. • Two people are able to move the goal quickly without any lifting. • Each goal has five semi-pneumatic wheels that glide over the playing field. • Wheels lock in place when the goal is in use. 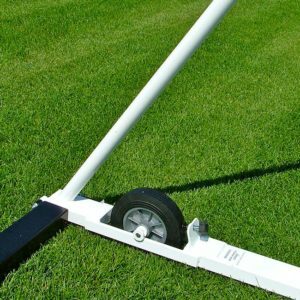 • May be used on grass or artificial turf. 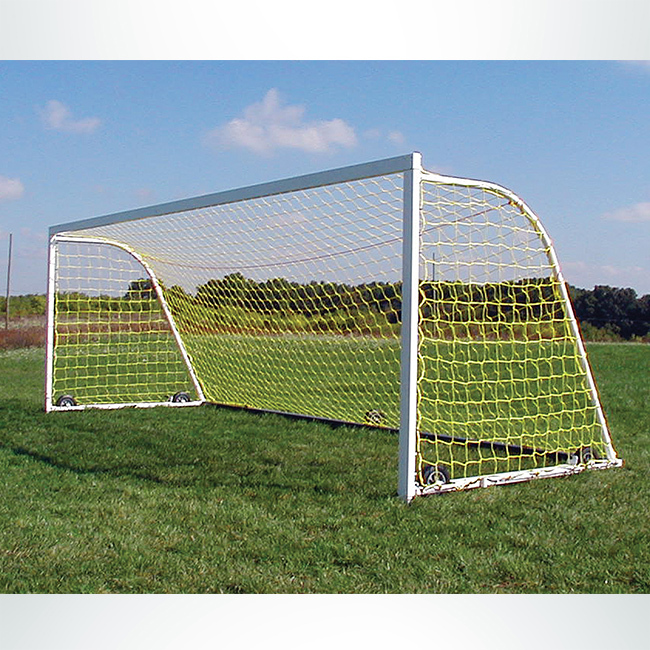 • Extra heavy-duty design provides years of safety and easy movement without lifting the goal frame. • Players relate to full-size goals during all drills. 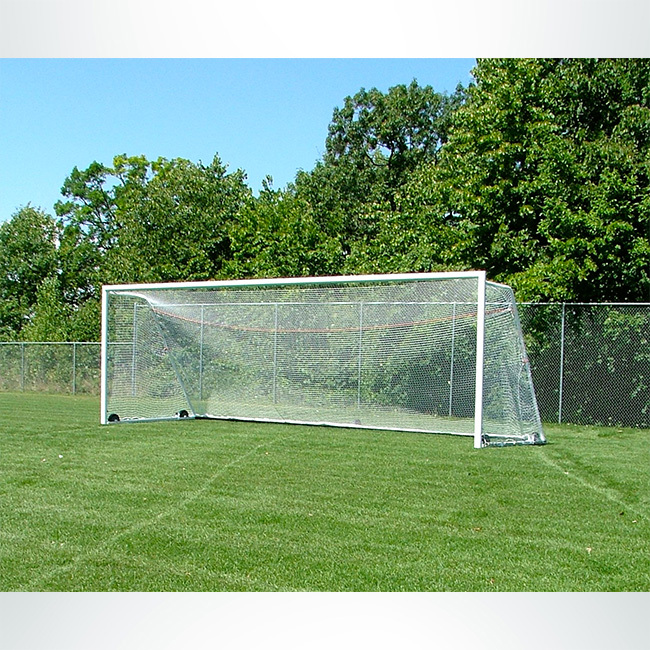 • Goals are easily moved to maintain balanced wear on the grass, giving players a better practice surface. 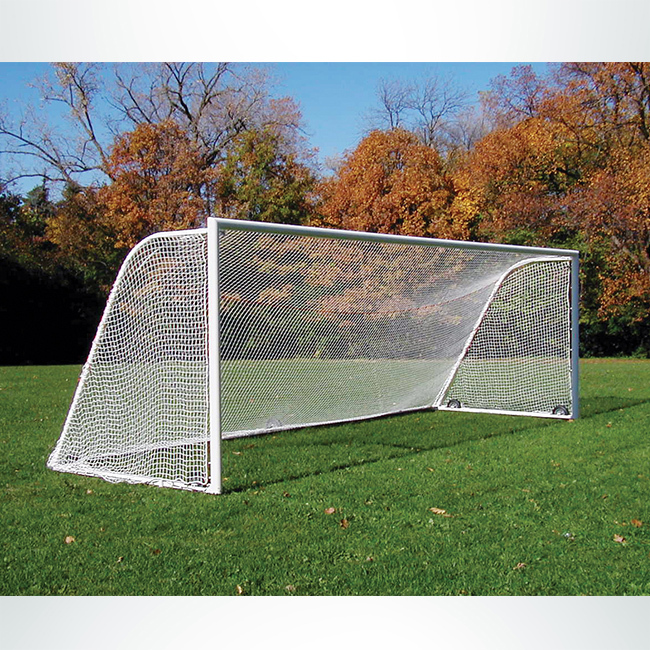 • Base of the goal is off the ground while 8 ft. height is maintained. Assembly: Goals are designed for quick assembly, with just four pieces that are sleeve fitted, then bolted together. Wheels: 5 semi-pneumatic wheels are built into the base of the goal. Color: Standard is white for crossbar, verticals and Side panels. Backbar of goal is powder-coated black. Custom colors are available. Finish: Standard finish is powder-coating. Zinc primer and hot-dip galvanized finishes are available options. Zinc primer is recommended for areas with extreme weather. Hot-dip galvanized finish is recommended for saltwater locations. Included Items: Cable net attachment system, stakes or duckbill anchors. Nets sold separately. Caster wheels available for an additional cost. Contact us for pricing on caster wheels. 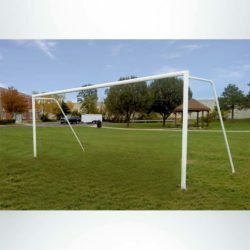 Additional weight can be built into the frame to make the goals comply with ASTM regulations when they are not anchored. Contact us for pricing or information. Portable Wheeled Soccer Goals can be custom designed with a shorter back-depth if you have space constraints. Contact us for pricing or information. Portable Wheeled Soccer Goals can be custom made in multiple sizes and colors. Contact us for pricing or information. 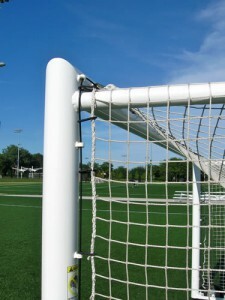 FOR SAFE, EASY NET ATTACHMENT: Cables run along the back of the goal. Simply attach the net with the safety snap hooks (#HO-2 on uprights and #HB-4 on groundbars). When clips wear due to weathering use the #HR-1 to replace clips without re-cabling goals. The self-supporting design is counterbalanced with a full 4″ x 2″ steel base frame. Each goal has welded stakeholders. Meets ASTM safety standards for soccer goals when anchored and assembled per manufacturer’s directions. Categories: 6' x 12' Soccer Goals, 6'6" x 18'6" Soccer Goals, More Sizes, Soccer, Soccer Goals, 8' x 24' Soccer Goals, 7' x 21' Soccer Goals. Tags: 6'6" x 18'6" wheeled soccer goals, 7' x 21' wheeled soccer goals, 8' x 24' Soccer Goals, Full Size Soccer Goals, Sue Moynihan, Wheeled Soccer Goals.